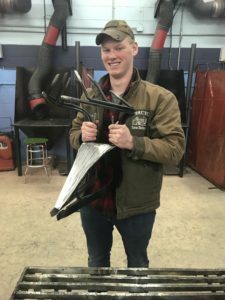 Farm Mechanics student, Cody Tucker, recently finished a welding project of a deer head. Congratulations Cody on a job well done! 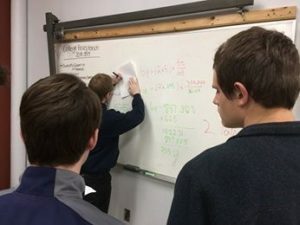 Recently, our afternoon Drafting & Engineering Technology students were learning the value of math in engineering and how it can be used to solve complex problems. In engineering guessing the answer is a major no-no. Even if your guess is correct you need to be able to prove that it’s right and that is where math comes in. In this case it involved a bit of engineering history as well. In 1906 Fred Marriott, driving a specially built Stanley Steamer on the sands of Daytona Beach, set a worlds speed record of 127 mph. Marriott’s record for an automobile stood until 1911. So… the question was what was the bursting pressure of the boiler, how much did it weigh? If the shell had a bursting pressure of a little over 600 psi yet Marriott had the boiler cranked-up to 1,200 psi why didn’t it explode? How thick would the shell need to be so it wouldn’t explode? Mr. Andrew Churchill and Mr. Bryan Fuller from MMG visited with students in the Business Department to kick off the Invest program. Students were provided with information about the company and were also introduced to many different business and interview tips. 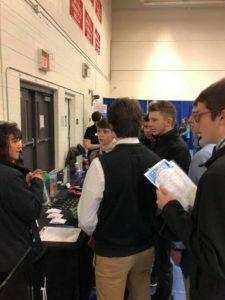 We appreciate the collaboration with MMG and are thankful that our students can learn about the opportunities that are available for careers right in Aroostook County! Thank you MMG! Our students are looking forward to learning more from different MMG representatives throughout the semester. 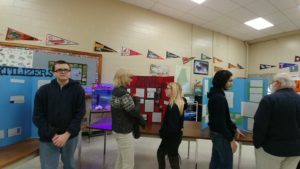 AgriScience students were able to showcase their individual science fair projects during our Annual AgriScience Expo on the morning of March 6. These students are to be congratulated on their hard work and professionalism in presenting their projects. Special thanks to the students, faculty and school board members who attended this important event! 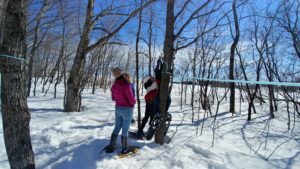 Natural Resources has been busy at the school farm helping to tap the 300 maple trees to prepare for the spring syrup season. They also welcomed Mrs. Cote’s second grade class one day to demonstrate tree tapping and the process of how syrup is made. 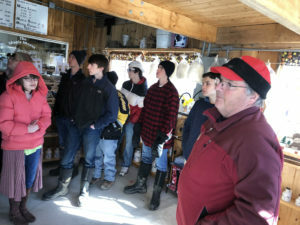 The kids were also treated to maple taffy courtesy of the school farm staff. 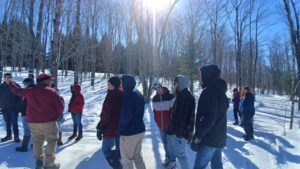 To end the unit, plant sciences and natural resources students visited the Maple Moose in Easton to compare a larger commercial operation with a smaller scale operation. 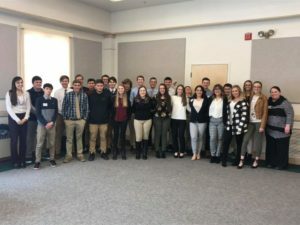 The Junior Achievement Titan Challenge is a day set aside for business students to showcase their ability to keep their “business” successful. 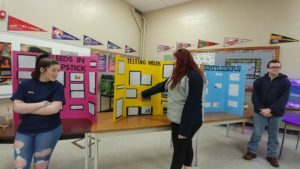 Students compete against teams from across the county and state to try and outlast the competitive marketplace. Students are teamed with advisors from business and industry to help them with the competition where they have to decide what funds they will use in areas such as research and development, marketing, and charity. This is a great opportunity for our students to meet business representatives and showcase their business knowledge. 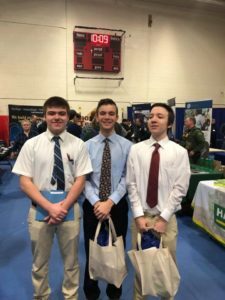 Students from several PIRCTC programs attended the Career Fair at NMCC. 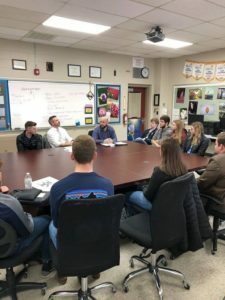 Students were able to connect with members from Business and Industry in fields they are interested in pursuing in their futures. Thank you Mrs. Lovely and Mrs. Smith for taking students on this adventure! 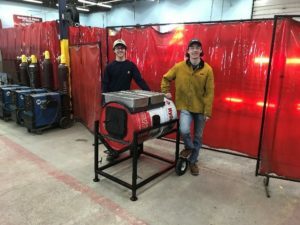 Students from Mr. Espling’s Farm Mechanics class took on the project of making a maple syrup evaporator.